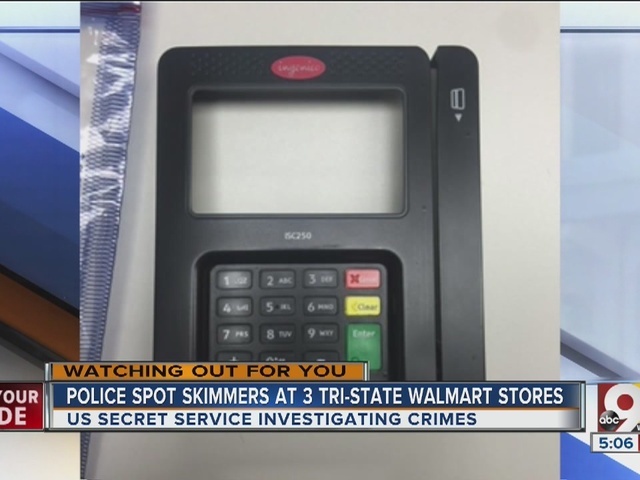 FORT WRIGHT, Ky. -- Associates at Wal-Mart Supercenter found a credit card skimming device Wednesday after it had been on a card reader in a self-checkout lane for a week. Wal-Mart Asset Protection Associates determined two men installed the device on May 11. Sgt. George Kreutzjans has been an officer in Northern Kentucky for over a decade. He said this is the first time he has ever heard of a case of credit card skimming in Fort Wright. Although he is not sure of the exact number, he estimated that anywhere from 500 to 1,000 credit cards could have been ran through the skimmer. He said Wal-Mart is working to identify everyone who has swiped a credit card at that particular self-checkout. According to Kreutzjans, the two men went through the store, put items in their cart and went to the self-checkout lane where they installed the small device. One of the suspects held up an article of clothing to conceal the other man while he clipped the cover on top of the credit card reader. He said the suspects then purchased the items as if they were normal shoppers. He said it is likely the suspects purchased items to test the newly-installed skimmer, and he thinks it is possible the men have installed skimmers at other local Wal-Marts. The Fort Wright Police Department has been following leads on this case and asks that anyone with information call Crime Stoppers at 352-3040.